Shooting over your dog and working him in the field would be quite straight forward if it were not for distractions and temptation. If every bird was dead and if every bird shot was a single bird, then life would be quite easy. Going shooting with your dog, however, is never that easy. On a number of occasions, I have seen a dog make a lovely retrieve of a wounded bird - only to put it down and go chasing after another one that was shot and fell from the sky as he was returning... and the wounded bird is lost. 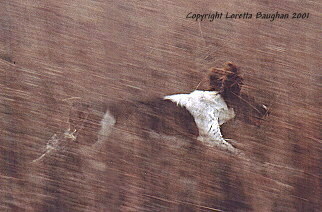 I have seen dogs put birds down to go chasing after an unshot bird or rabbit that runs across their path as they return. And, I am sure most of us have had experience of a dog who on the way out to a retrieve, scents unshot game and gives chase - forgetting about the one that it was sent for. There are so many distractions and temptations in the shooting field that will create problems. In our training, we need to recognize them and work at minimizing the difficulties that can arise. Ensuring that your dog is sent off in the right direction for the specific retrieve you require is one of the most important aspects of having your dog ignore distractions. He needs to know what you want him to do. He must be sure in his mind what you are sending him for and focus just on that one - unless you change the instructions. "Read your dog’s reaction and whether he is working for and with you or whether he is being tempted."